Some classification schemes are discussed in the following sections. Secure VPNs use cryptographic tunneling protocols to provide confidentiality by blocking intercepts and packet sniffing, allowing sender authentication to block identity spoofing, and provide message integrity by preventing message alteration. IPsec (Internet Protocol Security) was developed by the Internet Engineering Task Force (IETF), and was initially developed for IPv6, which requires it. This standards-based security protocol is also widely used with IPv4. Layer 2 Tunneling Protocol frequently runs over IPsec. Its design meets most security goals: authentication, integrity, and confidentiality. IPsec functions by summarizing an IP packet in conjunction with a surrounding packet, and encrypting the outcome. Transport Layer Security (SSL/TLS) can tunnel an entire network's traffic, as it does in the OpenVPN project, or secure an individual connection. A number of vendors provide remote access VPN capabilities through SSL. An SSL VPN can connect from locations where IPsec runs into trouble with Network Address Translation and firewall rules. Datagram Transport Layer Security (DTLS), is used in Cisco's next-generation VPN product, Cisco AnyConnect VPN, to solve the issues SSL/TLS has with tunneling over UDP. Microsoft Point-to-Point Encryption (MPPE) works with their Point-to-Point Tunneling Protocol and in several compatible implementations on other platforms. Microsoft introduced Secure Socket Tunneling Protocol (SSTP) in Windows Server 2008 and Windows Vista Service Pack 1. SSTP tunnels Point-to-Point Protocol (PPP) or Layer 2 Tunneling Protocol traffic through an SSL 3.0 channel. MPVPN (Multi Path Virtual Private Network). Ragula Systems Development Company owns the registered trademark "MPVPN". Secure Shell (SSH) VPN -- OpenSSH offers VPN tunneling to secure remote connections to a network or inter-network links. This should not be confused with port forwarding. OpenSSH server provides a limited number of concurrent tunnels and the VPN feature itself does not support personal authentication. Tunnel endpoints must authenticate before secure VPN tunnels can be established. User-created remote access VPNs may use passwords, biometrics, two-factor authentication or other cryptographic methods. Network-to-network tunnels often use passwords or digital certificates, as they permanently store the key to allow the tunnel to establish automatically and without intervention from the user. Tunneling protocols can be used in a point-to-point topology that would theoretically not be considered a VPN, because a VPN by definition is expected to support arbitrary and changing sets of network nodes. But since most router implementations support a software-defined tunnel interface, customer-provisioned VPNs often are simply defined tunnels running conventional routing protocols. Depending on whether the PPVPN (Provider Provisioned VPN) runs in layer 2 or layer 3, the building blocks described below may be L2 only, L3 only, or combine them both. Multiprotocol Label Switching (MPLS) functionality blurs the L2-L3 identity. RFC 4026 generalized the following terms to cover L2 and L3 VPNs, but they were introduced in RFC 2547. A device at the customer premises, that provides access to the PPVPN. Sometimes it's just a demarcation point between provider and customer responsibility. Other providers allow customers to configure it. A PE is a device, or set of devices, at the edge of the provider network, that presents the provider's view of the customer site. PEs are aware of the VPNs that connect through them, and maintain VPN state. A P device operates inside the provider's core network, and does not directly interface to any customer endpoint. It might, for example, provide routing for many provider-operated tunnels that belong to different customers' PPVPNs. While the P device is a key part of implementing PPVPNs, it is not itself VPN-aware and does not maintain VPN state. Its principal role is allowing the service provider to scale its PPVPN offerings, as, for example, by acting as an aggregation point for multiple PEs. P-to-P connections, in such a role, often are high-capacity optical links between major locations of provider. User-visible PPVPN services This section deals with the types of VPN considered in the IETF; some historical names were replaced by these terms. In both of these services, the service provider does not offer a full routed or bridged network, but provides components to build customer-administered networks. VPWS are point-to-point while VPLS can be point-to-multipoint. They can be Layer 1 emulated circuits with no data link . The customer determines the overall customer VPN service, which also can involve routing, bridging, or host network elements. An unfortunate acronym confusion can occur between Virtual Private Line Service and Virtual Private LAN Service; the context should make it clear whether "VPLS" means the layer 1 virtual private line or the layer 2 virtual private LAN. A Layer 2 technique that allows for the coexistence of multiple LAN broadcast domains, interconnected via trunks using the IEEE 802.1Q trunking protocol. Other trunking protocols have been used but have become obsolete, including Inter-Switch Link (ISL), IEEE 802.10 (originally a security protocol but a subset was introduced for trunking), and ATM LAN Emulation (LANE). Developed by IEEE, VLANs allow multiple tagged LANs to share common trunking. VLANs frequently comprise only customer-owned facilities. Whereas VPLS as described in the above section (OSI Layer 1 services) supports emulation of both point-to-point and point-to-multipoint topologies, the method discussed here extends Layer 2 technologies such as 802.1d and 802.1q LAN trunking to run over transports such as Metro Ethernet. PW is similar to VPWS, but it can provide different L2 protocols at both ends. Typically, its interface is a WAN protocol such as Asynchronous Transfer Mode or Frame Relay. 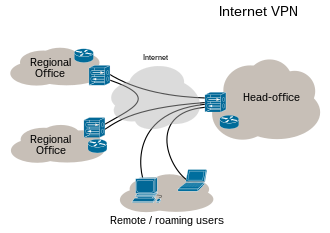 In contrast, when aiming to provide the appearance of a LAN contiguous between two or more locations, the Virtual Private LAN service or IPLS would be appropriate. A subset of VPLS, the CE devices must have L3 capabilities; the IPLS presents packets rather than frames. It may support IPv4 or IPv6. Virtual router architectures do not need to disambiguate addresses, because rather than a PE router having awareness of all the PPVPNs, the PE contains multiple virtual router instances, which belong to one and only one VPN. Some virtual networks may not use encryption to protect the data contents. While VPNs often provide security, an unencrypted overlay network does not neatly fit within the secure or trusted categorization. For example a tunnel set up between two hosts that used Generic Routing Encapsulation (GRE) would in fact be a virtual private network, but neither secure nor trusted. Besides the GRE example above, native plaintext tunneling protocols include Layer 2 Tunneling Protocol (L2TP) when it is set up without IPsec and Point-to-Point Tunneling Protocol (PPTP) or Microsoft Point-to-Point Encryption (MPPE). Multi-Protocol Label Switching (MPLS) is often used to overlay VPNs, often with quality-of-service control over a trusted delivery network. Layer 2 Tunneling Protocol (L2TP) which is a standards-based replacement, and a compromise taking the good features from each, for two proprietary VPN protocols: Cisco's Layer 2 Forwarding (L2F) (obsolete as of 2009[update]) and Microsoft's Point-to-Point Tunneling Protocol (PPTP). Mobile VPNs are used in a setting where an endpoint of the VPN is not fixed to a single IP address, but instead roams across various networks such as data networks from cellular carriers or between multiple Wi-Fi access points. Mobile VPNs have been widely used in public safety, where they give law enforcement officers access to mission-critical applications, such as computer-assisted dispatch and criminal databases, while they travel between different subnets of a mobile network. They are also used in field service management and by healthcare organizations, among other industries. Increasingly, mobile VPNs are being adopted by mobile professionals and white-collar workers who need reliable connections. They are used for roaming seamlessly across networks and in and out of wireless-coverage areas without losing application sessions or dropping the secure VPN session. A conventional VPN cannot survive such events because the network tunnel is disrupted, causing applications to disconnect, time out, or fail, or even cause the computing device itself to crash. ↑ Feilner, Markus. "Chapter 1 - VPN—Virtual Private Network". OpenVPN: Building and Integrating Virtual Private Networks: Learn How to Build Secure VPNs Using this Powerful Open Source Application. Packt Publishing. ↑ E. Rosen & Y. Rekhter (March 1999). "RFC 2547 BGP/MPLS VPNs". Internet Engineering Task Forc (IETF). http://www.ietf.org/rfc/rfc2547.txt. ↑ a b c Phifer, Lisa. "Mobile VPN: Closing the Gap", SearchMobileComputing.com, July 16, 2006. ↑ a b c Cheng, Roger. "Lost Connections", The Wall Street Journal, December 11, 2007. Kelly, Sean (August 2001). "Necessity is the mother of VPN invention". Communication News: 26–28. ISSN 0010-3632. http://web.archive.org/web/20011217153420/http://www.comnews.com/cgi-bin/arttop.asp?Page=c0801necessity.htm. "VPN Buyers Guide". Communication News: 34–38. August 2001. ISSN 0010-3632. JANET UK "Different Flavours of VPN: Technology and Applications"
This page was last edited on 8 May 2017, at 22:19.